If you have the talent of writing and used to write since childhood, this work is right for you. With the growth of the web, , many companies hire work-at-home writers to create content for their blogs and websites. Many also work as editors, correcting and verifying the work of other writers. Technical writers are responsible for writing manuals and guidance as well as online help systems. Many schools and other organizations hire professional teachers for their online courses. Opportunities are available at any level, from primary school teachers to online university courses. There are also many organizations that give the Internet coach the opportunity to create courses to teach a particular skill. Online courses and schools are increasingly popular. So if you love to help people and at the same time learn new things then online teaching is the right choice for you. You can teach language lessons, history lessons or any other field, the more visitors you attract, the more student you’ll have. Blogs can earn you all day through the articles and columns you constantly add. You can start your blog through Google or sites such as (blogger.com). The internet is full with successful bloggers who share their experience, knowledge, tips and tutorials. There are some online courses that teach you how to earn from your blog, the subject is not difficult only needs good thinking and some effort. What are your best skills/abilities? What is your passion? Business has become more global and has increased its need to communicate with customers in more than one language. For those who are fluent in several languages, global business has allowed for wider employment opportunities. Translators accurately change the language of documents and other information. Most translators are educated and have at least a college degree. Fluency in a language is the most important factor in getting a job of this kind. If you are bilingual, the translation may be a great opportunity. Although everyone has phones with a high-quality camera, there is still a lot of demand for photographers. Professional photographers have a great demand for special occasions (weddings, portraits, various pictures …) and are already well compensated for their services. Online websites, blogs, and publications are in need of high-quality images now. There are no educational requirements to become a photographer, but the photographer must be able to use the equipment to take high-quality photos or videos. Being a photographer is a funny job, it allows you to meet new people, visit different places, and sometimes you can take pictures of your own kids or the whole family. If you enjoy handicrafts such as accessories or home decorations, you can start a small project to sell what you are making through some sites on the Internet or display them on your own page on Facebook, many web services such as (shopify,bigcommerce) makes the whole process of putting your products online, getting paid and shipment really easy for you . It is a way to develop skills and creativity and make good money or maybe you can even start your own brand. Working from home can be a perfect choice for many people, especially those who love staying at home. Our presence in our homes can enhance motivation and creativity tremendously because everyone works better in a familiar, safe environment. However, it is not easy to work from home. Depending on your age and living situation, there may be some disadvantages. All you need to do is choose the work that you find suitable for you and for your children, choose carefully so as not to fall in some of the fallacies due to the ill-fated work. Even Though the internet is full of work-at-home job opportunities, trying to find the perfect job for your experience and skills can consume a lot of your time and energy, it’s not easy to filter out all the scams, keep an eye on the jobs you’re interested in, gather all your application documents and finish the whole application process. Fortunately, your smartphone can be very helpful, by installing the right apps it’ll become much easier for you to find the right job, organize your time and documents, and find other people who share the same career interests as you and even work and communicate with them. Indeed: This is a must have work-at-home agent, the application is available for both Android and IOS, you can choose from many available jobs and apply using your phone and your indeed resume, you can also get notifications of newly posted jobs or save some for a later check. LinkedIn: Another great way to search for new remote jobs, download the application and sign in using your LinkedIn account. While it doesn’t make any difference for companies whether you live far or nearby, some work-at-home jobs require you to be living within a close distance, so be careful while looking for a job and use the right words and locations in order to find relevant results. Another great option about the LinkedIn app is that it allows you to create a job alert and get a notification when a job that matches your skills and requirements is posted, this can be very helpful in reducing the time you spend looking for a job. Craigslist app: A desktop version is also available for craigslist, but what makes the phone app more flexible and easy is how fast you can switch between cities while you’re searching for a job, make sure to start with major cities such as Los Angeles, Houston, New York…etc. Because they have a huge number of work-at-home job opportunities listed unlike less populated cities. Make sure to search for both jobs and gigs section, use keywords such as remote, virtual, work from home to find the kind of jobs you’re looking for. The search process can reach a point where it will become so complicated and overwhelming, But don’t worry, these apps will keep everything organized for you. Everton: It offers you a space to store all your digital files, notebooks, cover letters, screenshots, resume…etc., it can very helpful for you to keep track on everything especially that once you create an Everton account you can access to your files from any device so everything you need will be available for you whenever you need it and wherever you are. Trello: This app is getting more and more popular for good reasons, Trello is a great way to keep track of every job you’re interested in by creating a card for each job. You can save a lot of time and effort using Trello because the process is quite easy and fun. 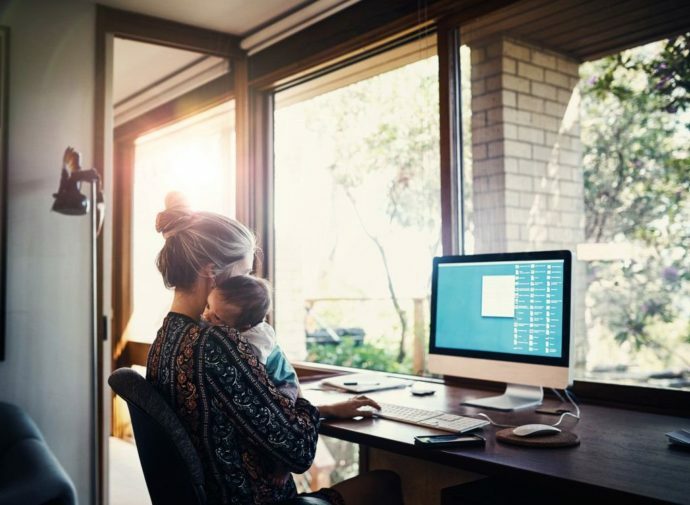 Being a work-at-home mom doesn’t mean you have to isolate yourself, in fact, networking and communication are highly required to be successful. For example, LinkedIn allows you to connect with others who share the same interests as you and build professional relationships with people who you’d be willing to work in the future. Take all the time you need to complete your profile and make it look amazing and professional, the first impression matters the most. Skype is also a very important tool that you need to be familiar with, Most work-at-home jobs require an interview (video calls), Many employers prefer a direct video call to get all the information they need, so keep that in mind and always be ready. Scams can be found on any Job board so make sure to filter out all the work-at-home opportunities that seem too good to be true because there is a high chance that they are, so be careful before sharing your personal information. Are you looking for a way to take advantage of your spare time? Or invest your energies and reap some money? Are you dreaming of working only when you want to while enjoying flexibility in your time without giving up on your other responsibilities? Web designer is one of the most popular jobs in the work-at-home field, anyone with the right talent and experience can design sites, blogs for companies and organizations or even individuals. All what you need to get started is some simple agreements which can be completed by e-mail or other social media. Web designers design and maintain websites. The web developer handles the site’s code and infrastructure. They must know how to optimize the site and how to deal with the problems that may arise. Web developer’s salary varies according to his level of experience and skills, the average salary is around $ 30 an hour. The advantage of this work is that it doesn’t need a specific place because of the nature of the translation, which depends on the translator’s own ability and language proficiency. You may need a glossary. This is of course easy to use at home or wherever you want to work. In case you are proficient in more than one language, you can contact the person you think is interested in this service and offer translation of texts, correspondence, papers and research. The secret to success in this work is to meet the deadlines for delivery and accuracy in translation and the transfer of vocabulary from one language to another. The average salary for this type of work is $ 20.96 per hour. Sales representatives convince consumers to purchase a variety of products and services, ranging from real estate to consumer products and other things. Many salespeople work from home and communicate with the customer by phone, but some sales-related jobs require face-to-face meetings. Sales professionals often receive a basic salary and commissions based on the amount they sold. For this reason, compensation varies greatly. The average salary can range from $ 35,000 a year to a person working for a travel agency and up to $ 58,000 a year for a salespeople who is dealing with wholesale. Educational requirements to become a salesperson vary greatly. Some jobs require a university degree, but for many jobs the prerequisite is a secondary certificate. In case you want a Fun and high paying job in the same, trust me this job is for you. If you are an artist or simply have talent in design, there are plenty of jobs available for you. Graphic designers design anything from corporate logos to posters and advertisements. The average salary for a graphic designer is about $ 22.00 per hour. Many graphic designers have specialized design training. Competition is fierce in this area, so if this is your f make sure you have a strong record of business. Virtual Assistants perform administrative tasks that include searching, answering mail and phone calls. They also deal with other routine tasks. Companies or individuals employ virtual assistants to handle repetitive tasks that consume time so that they can spend more time on tasks that brings money. There are no learning requirements for the virtual assistant. Some specialist virtual assistants may have training in a particular field. For this reason, experience and reputation are important for the virtual assistant. They can earn almost $ 15.00 an hour in some countries. The phenomenon of women who work-at-home, especially moms, is the most prominent social phenomenon in the modern era, because it does not hinder her from her main role in the family as a wife, housewife, and mother, in fact she is adding a new important rule which earning money from work that was previously reserved for men Alone . She can get a job online from home if she acquires the skills to do a professional online service. Why you should become a Work-at-home Mom? Some mothers may be wondering, How do we prove ourselves and achieve our ambitions in our presence and stay at home in the private space? It is not the productive work that provides consumer goods and services to the society, but rather the humanitarian work that is based on the production and construction of the human being. Thus, motherhood becomes one of the most important productive works, this reality reduces women’s sense of helplessness, inferiority, and futility. It’s easy to think that you’ll never going back to where you left in your career if you quit the job you have dedicated your whole life to in order to stay home with the kids, but have you ever thought about taking care of your children and in the same time manage work from home? Many moms have chosen some available opportunities and take on a work at home job, or they simply create their own. Working from home gives you great opportunities to connect with your family and community and at the same time requires you to learn discipline, focus and commitment. 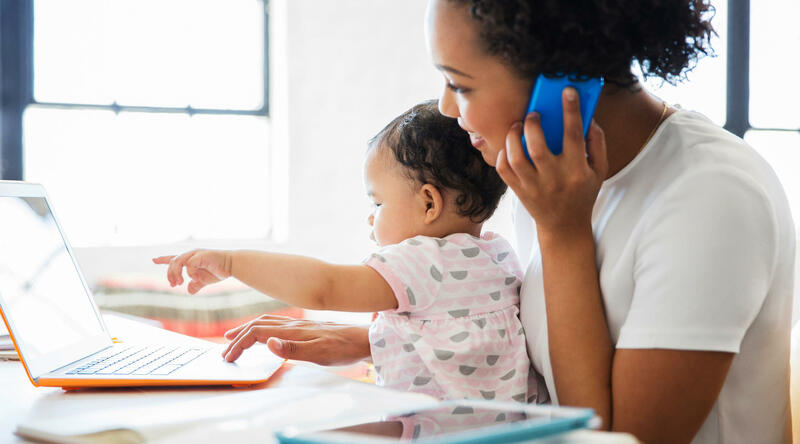 If you’re a work-at-home mom, you can prioritize according to your own circumstances, and so you can freely work where you want whenever you want and in conditions that definitely suits you. With little organization, the main advantages can be learned. Some see it as a way of saving many of the expenses imposed by going out to work every day. Working mothers can take care of their children and follow them closely. Working at home can be a relief because you stay with your family members, especially your young children, so you can easily meet their needs and requirements. As a work at home mom, there is always time for your kids. After all, the most important thing is that your kids are in a loving, stimulating and positive environment. Women’s most important priority is to always be there for their sons in need, and if they aren’t mentally and physically prepared for such thing, there’s a high chance that their kids won’t experience a normal childhood as the others. Working outside your home is accompanied by a tension which can be stimulated by moving from place to place, conflicts between co-workers or competition. Not to mention how being stuck in the traffic will consume your energy even before the start of the day, especially if the workplace is far away from home. As for other stressors, We can include non-friendly workmates as well as an invalid work environment and distracting factors. Working from home is an important factor in increasing productivity, for the simple reason that you’ll be working in your preferred environment with your own rules. In addition, work from home can be considered as one of the factors that will make you happier, and gives you the opportunity to become a successful business woman. Working from home eliminates the costs of commuting, so by working at home the commuting time saved enables you to do some physical exercises or go for a long walk with your kids, and you don’t have to think of what you should wear every day, in addition you will avoid stress and store positive energy that will be beneficial in taking care of your child. The bottom line is, working woman is a woman worthy of respect and appreciation, because she is strong and able to reconcile between her home and her family and her work, and she is an ambitious woman who refuses to be dependent on anyone and contributes to building her society effectively, because she supports the man and stands beside him and puts her hand in his hand to build her homeland. Thus, no country in the world can develop effectively except with the cooperation of its women and men all in its work and in the extent of the responsibility that surrounds it. There is always positives and negatives of working whether home or outside. After all, it all depends on how capable a woman is to do both jobs without leaving any disorder that would affect her functions and what her kids expect from her as a mom.